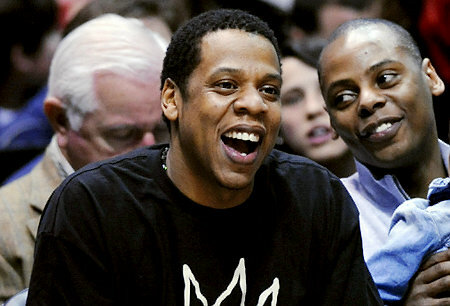 *The New Jersey Nets have been fined $50,000 for Nets minority owner Jay-Z’s presence in the Kentucky locker room after the Wildcats clinched a Final Four berth, reports ESPN.com, citing sources with knowledge of the penalty. Word circulated around the league Friday that an unnamed team — which sources confirmed to ESPN.com is the Nets — was fined for violating league rules that prohibit contact with players who still have collegiate basketball eligibility remaining. The NBA’s investigation, first reported by CBSSports.com, was triggered by a video showing Jay-Z visiting with various Kentucky players in their locker room at Prudential Center in Newark, N.J., after the Wildcats’ quarterfinal victory over North Carolina. Though the circumstances of the visit seemed harmless enough, with Kentucky players clearly more excited about meeting a world-famous rap mogul as opposed to a part-time NBA team executive, Nets officials were expecting a fine based on what happened to Boston Celtics general manager Danny Ainge in 2007. Boston was fined $30,000 that year for “excessive contact with the family” after Ainge was spotted sitting next to Kevin Durant’s mother at the Big 12 tournament. lololololololololol…yall thumbs down my comment on this article 2 weeks ago. I think $50K is pocket money for Jay. I really think this story is much ado about nothing.